This recipe has been a tradition in our home for many years. 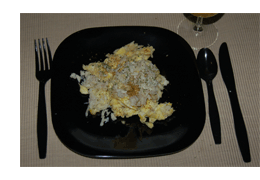 Whenever we make crab cakes or crab soup, we reserve a little bit of crab meat to make these delicious scrambled eggs. Beat the eggs, and pour into a warmed non-stick skillet. Sprinkle the eggs with about 1/8 tsp of Old bay Seasoning. Cook eggs until the egg bottoms being to firm up, then use a spatula to to mix up the eggs. When most of the egg is cooked, add 2 tbsp the crab meat and gently stir in. Continue to cook eggs, stirring gently until eggs are firm, then remove from pan to serving dish, top with Monterey Jack cheese. Add the other 1 tbsp of crab meat to pan. When crab meat is warm use to top the eggs, and finally garnish with Cilantro leaves. Dust with a light coat of additional Old Bay Seasoning and then serve. Mix together. Chill. Serve as dip or sauce. In saucepan combine first four ingredients. Bring to a boil. Add shrimp, stir gently. Cover; steam until tender. Drain remove shells and vein on back. Pot should have a raised rack, minimum 2″ high. Add equal quantities vinegar and water to just below level of rack. Layer crabs; sprinkle each layer with mixture of salt and Old Bay Seasoning. Cover and steam until crabs are red. 2 slices white bread with crust removed. Break bread in small pieces and moisten with milk. Mix ingredients, shape into cakes. Fry quickly until brown. Wash chicken and pat dry. Mix flour and Old Bay Seasoning in paper bag. Heat cooking oil in a large skillet. Combine water and egg in mixing bowl. Dip chicken in egg mixture, then in flour mixture (a few pieces at a time.) Fry over medium heat until golden brown about 20 minutes on each side. *For more flavor, use Old Bay Seasoning to sprinkle over finished chicken. Mix Old Bay Seasoning thoroughly in meat. Fry or broil as usual. Serves 4 to 6. Preheat oven to 500° F. Cook the penne pasta according to package directions. Meanwhile, melt 1 tbsp of the butter in a small non-stick sauce pan, add bread crumbs and stir to wet the crumbs with the butter. Add the Parmesan cheese, stir in well, and set aside. Melt the remaining 1 tbsp butter in a medium non-stick sauce pan. Add flour to make a roux, and cook, stirring until flour is bubbly. Gradually add milk, stirring a little add a time, and blend in with the flour/butter roux. Keep heating and continuously stirring the milk mixture for 4 – 5 minutes over medium heat until milk begins to thicken. Add the Monterey Jack Cheese and Old Bay Seasoning and mix well. Gently fold in the crab meat. Fill two ramekins about 2/3 full of the cooked penne pasta, pour in enough of the cheese mixture to reach top of pasta, then stir to mix cheese well around the pasta. Pour more cheese sauce in to fill to top of ramekin. 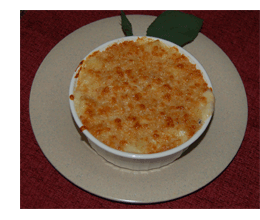 Repeat with second ramekin. Sprinkle tops of each ramekin with the Parmesan bread crumb mixture. Place the ramekins on a flat baking sheet and bake at 500° F about 6 to 9 minutes until cheese is bubbly and tops are lightly browned. Remove from oven, and let cool about 5 minutes before serving. If you don’t have day old bread, use fresh bread and break bread into small pieces and moisten with milk. Add Worcestershire sauce, dried parsley flakes, baking powder, Old Bay Seasoning, egg, and salt and mix to blend seasonings. Add crab meat and carefully mix to keep the lumps of crab meat together. Shape into 4 to 6 crab cakes. Broil for reduced fat or fry until golden brown , then turn and cook until other side is golden brown. Use a double boiler to melt butter and cheese. Add crabmeat, Worcestershire sauce, and Old Bay Seasoning and mix together. Continue to heat the crab meat Dip until mixture is thoroughly warm. Transfer the hot crab meat dip to chafing dish to keep warm. Serve with pieces of freshly baked French or Sourdough bread. In a 3 quart saucepan combine 1/4 cup vinegar, 1 1/2 cups water, and 1 tbsp McCormick Old Bay Seasoning. Bring to a boil, then add 1 pound deveined shrimp. Stir shrimp around until coated well with the Old Bay Seasoning Mixture. Cover pot and then reduce heat to simmer, and cook just until shrimp turn pink. Stir once more, then drain. Place shrimp on a serving dish. Serve immediately along with cocktail sauce. If you want an easier way to make this recipe (and. really now, this Old Bay Shrimp recipe isn’t hard) then consider Old Bay Seafood One-Step, which lets you simply add the seasoning to water, and then the shrimp. Simple and easy. Details of making Seafood One-Step are here. This is our cooking and recipe site related to our absolutely favorite seasoning, Old Bay. Over time, you will get a sense of our love of Old Bay, and we use it with almost anything. So stay tuned and we hope you enjoy our collection of recipes. Old Bay Seasoning was created by Gustav Brunn, a Geman immigrant to the United States as was originally called “Delicious Brand Seafood Seasoning”. The Seasoning was later named Old Bay Seasoning, after the name of a steamship line the traveled on the Chesapeake Bay between Maryland and Virginia. 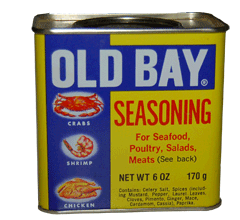 Old Bay Seasoning was made by the Old Bay Company, Baltimore Maryland. The company was purchased by McCormick & Co during the 1990’s who continues to manufacturer the product. Here in the Chesapeake region, Old Bay is a favorite spice and is used to season many foods, most notably crabs and shrimp. But Old Bay Seasoning is often used to simply season French fries, hash brown potatoes, and burgers. Our goal here in this Old Bay Seasoning blog is to share our love for Old Bay Seasoning with the world. We will make lots of the recipes and take pictures of the prepared recipe. Sometimes we’ll simply list the ingredients and cooking instructions with plans for a photo to be added at a later date.